Congratulations on your engagement! There will be a lot of planning to do in the months ahead. One thing you don't want to overlook is thinking about whether you want to do your own makeup for your wedding or hire a professional. Whatever you decide, you'll want to look picture perfect for this very special day! Get started on a skin care regimen. If you don't get regular facials, make sure you start at least a few months before the big day. A facial will get your face in tip top shape for that perfect makeup application. Don't plan on starting the week before your wedding day. Having a facial can pull impurities to the surface, and you do not want to break out the week of your big day. Drink plenty of water. Your skin needs proper hydration to look its best. Bridal magazines are the best source to help you find the look you want to achieve. Tear out pictures of makeup applications that you would like to see yourself wearing. Practice your makeup before the big day. You do not want to do it the day of your wedding and end up with makeup you are not happy with. 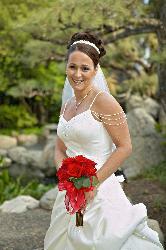 A preview consultation should be set up with your makeup artist 6 - 8 weeks before the wedding. Take pictures from your magazines with you. This will help your makeup artist get an idea as to how you want to look on your wedding day. If you prefer doing your own wedding makeup, do have a makeup lesson with a makeup artist at least 3 months before the date. This will give you practice time to perfect your look. You'll need to take into consideration the lighting. Different lighting warrants different makeup. Nighttime lighting tends to show less and a stronger makeup should be applied. Day lighting tends to be more natural. Also, keep in mind the kind of pictures you will be taking. Black and white or color pictures will determine what kind of makeup you'll need as well. Ask your makeup artist to help you determine what colors will best suit you. Make sure your foundation matches exactly. If you normally don't wear foundation, you definitely should think about doing so for your wedding. Keep your makeup natural. Less is more. Think "classic." Don't do anything dramatic or different if it is not your style. Remember these pictures reflect who you are and should bring out your own natural beauty. Wear a waterproof mascara for those "tears of joy" and wear eyeshadows that have a matte finish. Frosts and glitters do not do well in pictures. Let's not forget those lips!! Stay with colors that are complimentary to your skin tone. It is okay to wear a deeper shade of pink if you know that pinks look good on you. You can definitely wear reds as well, but make sure the undertones are complimentary to your skin tone. If you do decide to use a makeup artist, which definitely is the less stressful way to go, they are usually available to stay for picture touch ups for a nominal fee. Make sure your artist gives you the lipstick and lip liner colors she used on your face so that you can purchase these items to keep in your purse for touch ups. Definitely have your lipstick, lip liner, and blotting papers easily available at all times, even if this means assigning someone in your wedding party to hold them for you. This is all you will need to keep your face looking fresh. Get lots of rest, stay stress free and pamper yourself! Have your hairstylist and makeup artist come to you. It is your day to shine! © Copyright 2003 Purpose Media and Uptown Girl Makeup. No unauthorized duplication without written consent.